This has become a complicated beast! Therefore a system setup tool is built into the game. It enables you to run the game in full beauty on a +2MB STe or in a reduced setup in a 1MB Machine. Technically it should even run on a standard ST(f) but with a massively lower framerate. So the ST(f) is no official option to playing the game. At any time the game needs full writing access to the Floppy/Harddrive it is played from! If you play it from a Floppy, do not write protect the Disc! 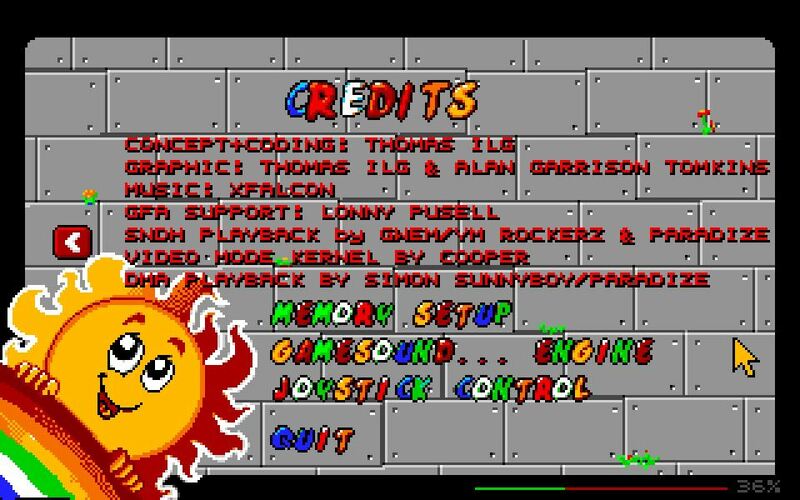 You can enter the setup screen by pressing any key at game start or by entering it from the main menu. Some options force a restart. Some options become active only after restart. Listening to the beautiful tunes form xFalcon results in a little lower framerate Its up to you! Joystick is by far the best way to handle the game, but if you do not have one, ride with the mouse! Any object is stored in the Memory in every single scale state. This takes lots of RAM. You can reduce the amount of scale states -> less memory consumption -> jumpier game experience. There is some math going on while playing. Math is not funny. Math takes time. Therefore some math can be done before hand and the results are stored in RAM for a higher framerate. BUT this takes RAM! You can reduce the Prerendered Values -> Less memory usage -> quicker game start -> slighty lower framerate. Streets come in different forms: Normal, Beach, Highway But using more street designs in one Track, means massive amount of memory being used. You can reduce track designs here -> Less memory consumption -> some levels have lesser variations in Track designs. Music needs RAM as well. Not loading it, saves lots of space but: No Music. The ride becomes a bit quicker without music. Starts a screen with lots of weird boring things going on. Not as boring for the developers of the game. This option load all the beautiful graphics of the Drivers-Cars to the memory for fast access. But it also takes RAM. 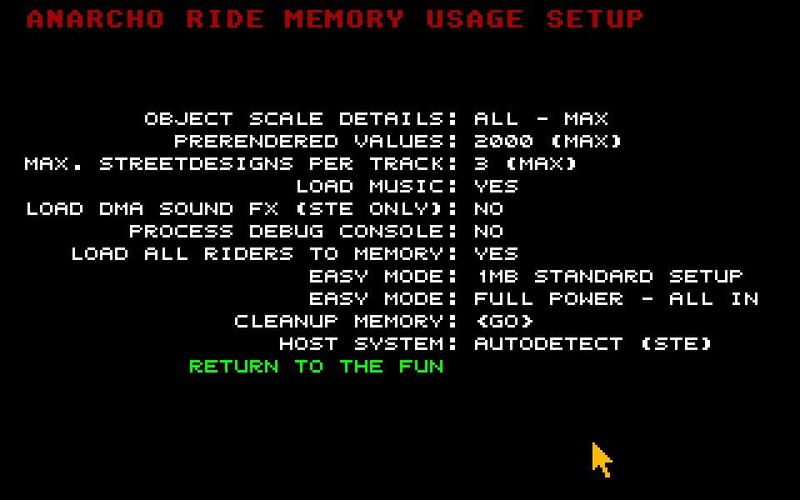 Switching it OFF also has an impact on the Gameplay: when playing from FLOPPY DISC new riders/cars coming from expansion packs, can only be used if the option "Load all rides to memory is set to "YES ! Choose from a 1MB standard setup or do the opposite. Writes a file in the ANARCHO Ride directory containing the last 300 lines of the debug console data. Attention: this function will let likely let the game crash if it is called from the original game floppys. Simple reason: the floppy has not enough space left to store the file. This is to be used from harddrive only. This option changes the details in which the street is painted to the screen. Going to "MEDIUM" or "MIN" results in higher frame rate but more edgy street looks. If there is "AUTO switched on, and your system is not shown correctly for example as "AUTO (STE) , you may overwrite the auto detection by selecting your system manually to "STF/STE/FALCON . Side information: this will result in a different handling of Sound. For FALCON users: if your Falcon plays DMA sound in the STE Mode, there is no reason why you MUST go to FALCON mode. The FALOCN mode has a slower startup.